Back in the day, the only lights you’d see at concerts were the bright strobe lighting of the stage, spotlights and the glow of people’s cigarette lighters sweeping arcs in the air during a powerful ballad. The fun police came in and killed the lighter movement. (Open flames in close proximity of crowds was probably an OH&S thing). Now, the brightest lights at concerts are the gleamings of people’s backlit display iPhones, digital cameras, digital camcorders and mobile phones. In the 90’s the light coming off a camcorder display or camera flash was so bright and beaconing it was enough to get you pounced on by security and turfed out of the venue. Not before, they dramatically exposed your 35mm film or stomped on your VHS-C tape. It seems in these modern times, the idea of concert recording and its dispersion on the Internet is acceptable. I’m glad that concert promoters can see the benefit for their artist in the viral and self-promoting nature of social media. Why bother advertising when your artist’s fans can do all the legwork for you? What do you have to lose? It increases the coverage through word of mouth, inspires further ticket and record sales. It feeds the hungry media beast. The sharing communities on such sites as Facebook, Twitter, Flickr and especially YouTube encourage the spreading of content. Attending a concert now seems more about a competition of who has the best recording equipment and who can get the content online the fastest and garner the most hits. If the concert is being professionally recorded to sell as a Live DVD or album, then issues of copyright come into play. 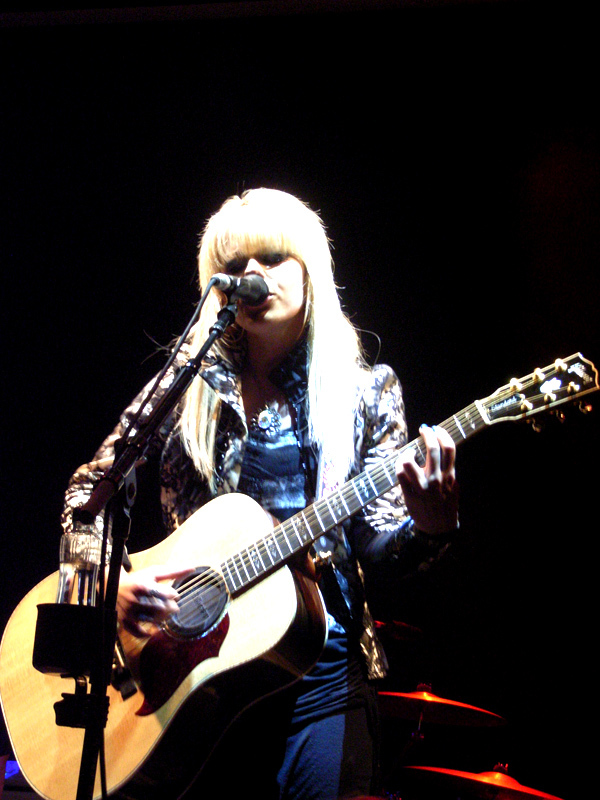 On Sunday the 9th May 2010, I was fortunate enough to see the very talented guitarist Orianthi live in Sydney. 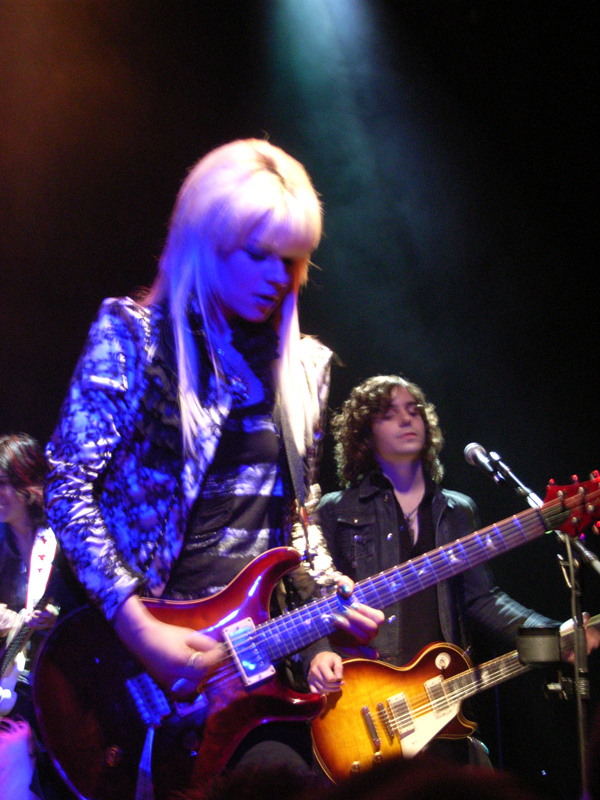 You might know her as the lead guitarist for the planned Michael Jackson “This Is It” concerts and subsequent doco-film. I’ve been to quite a few concerts over the last few years including The Rolling Stones, The Who, Elton John, The B-52s, Robbie Williams, Kylie Minogue, KC & The Sunshine Band (in Vegas baby!) but due to my inability to justify spending more than $100 for a ticket I’m always in the nosebleed section. So taking photos is generally ruled out. This time I managed to get 3 rows from the stage and only having to stand for 40 mins before the show to stake out my spot. I was using a run of the mill compact digital Ricoh. So here are some fruits of my labour. I converted this one to B&W in Photoshop using Channel Mixer. Note the blurred hand emphasising rapid movement. Somebody’s head was taking up the bottom right hand corner of this image and blocking the guitar so I airbrushed it out and cloned the guitar back in. Perfect. Be your own tripod – It’s a bit hard to lug around a proper tripod so make use of what you’ve got. I tense my elbows into my sides to keep the camera steady. Although a stranger tried to use my head as a tripod once, apart from being momentarily annoyed I actually thought it was a good idea. Don’t use the flash – Performers have enough to worry about without being constantly blinded by camera flashes. It’s not only distracting to them but to everyone else. Turn your flash off and slow down the capture rate on your camera to take more light in. Timing is everything – Wait until you’ve got a nice clear shot without people’s heads or arms in the way, wait until the stage is lit up brightly or using white light, it will act as your flash. Rapid fire – If your camera has a rapid fire setting, use it for short bursts of picture taking. The very nature of singing means the singer’s face and mouth is going to look weird 9 times out of 10. Increase your odds of a good shot by doing rapid succession shots and then pick the best. Use zoom sparingly – This all depends how close to the stage you are. If you are close, hold back on the zoom, the more you zoom in (especially digital zoom) the more grainy and blurry your images are going to be. Shoot on low zoom but high megapixel resolution and crop out the subject later. If you are wayyyyyy back, use all the zoom you’ve got! Never underestimate black and white – Coloured strobe stage lighting can wreak havoc on images. They can wash out the pictures in unwanted luminous hues. Convert your images in Photoshop to true black and white and toggle the contrast to bring out the richness of the image, it’s a real saviour. Do not use the desaturate function in Photoshop it will bland up your shots. My preferred method of conversion is using the Channel Mixer. Follow the instructions here for true B&W conversion. On the flip side, strobe lighting can give really cool coloured effects too. Blurry is ok, in moderation – Blurred photography is not always a bad thing. If you are trying to convey movement (such as a guitarist shredding or drummer in full swing), blurred detail of hands or arms can give the photo an edge. Line up off front and centre – First row, centre stage might seem like the perfect location but all your photos will have microphone stand in it, the microphone obscuring the singer’s face and a wickedly sharp angle looking straight up their nose. Position yourself a little bit off centre and hold the camera up higher if you are close to the stage. Steady does it – There is nothing more vertigo inducing than watching a Youtube video that someone has recorded while waving their arms around or dancing up and down. Anticipate their next move – Try and figure out where the subject is moving next and sweep the camera along with them in one motion. It stops the jerking of the image. 1. She is a female rock chick. For some reason its assumed that women are incapable of playing guitar. 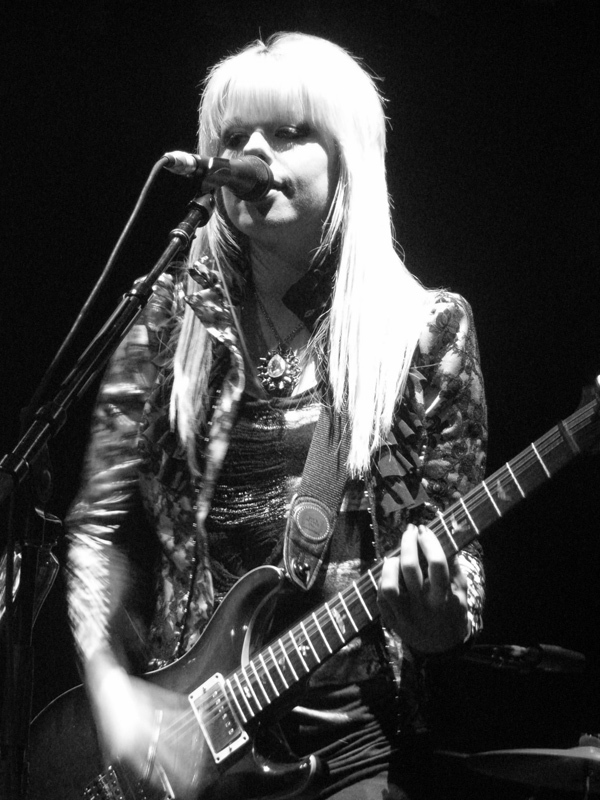 Like her predecessors Jennifer Batten, Joan Jett, Bonnie Raitt, Sheryl Crow et al – she shows the guys how its done. 2. She is Australian. That’s right, from Adelaide, South Australia. She is strutting it on the world stage. Goes to show no matter where you grow up you can make a name for yourself. 3. She shreds. Shredding is difficult and to ad-lib shred really shows your connection to feel the music. I have no idea how she can play with her eyes closed. and its worth mentioning she likes using the whammy bar and doing dive bombs. I bought a cheap Fender Stratocaster knock off on Ebay about 2 years ago and proceeded to self teach a few basic rock riffs. I am highly talented in the iconic riff of China Grove (Doobie Brothers) which I proceed to play over and over and over again and then throw in a Smoke on the Water (Deep Purple) for good measure. I am still yet to get around to serious lessons. Its on the to do list along with a replacement amp for the one I broke. (Note to self: switch off amp before plugging in heavy metal distortion pedal). 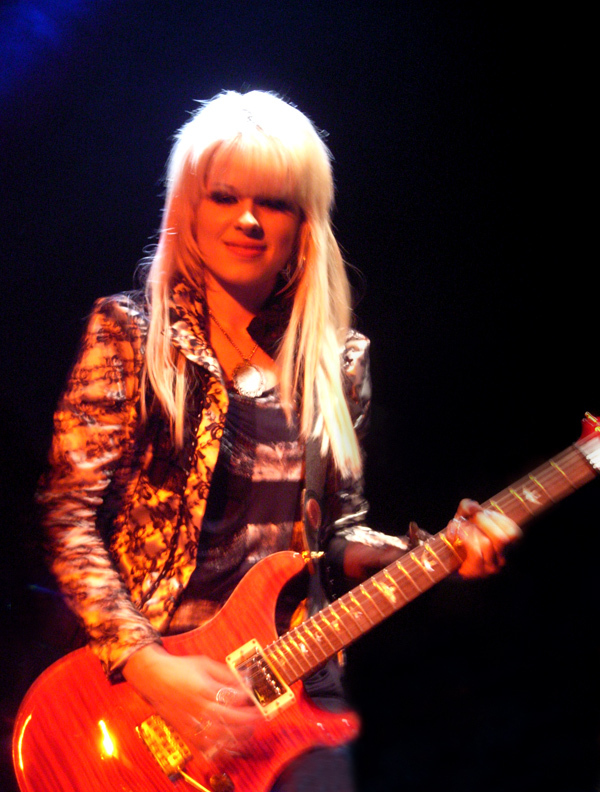 To think Orianthi is only a couple of days older than me makes me feel like a total dunce whenever I pick up the guitar.